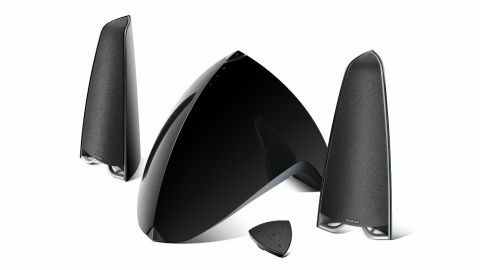 Does the Prisma Encore provide enough substance to make it a true audiophile grade 2.1 speaker system? For the price point the Prisma Encore provides fantastic sound quality and a stunning aesthetic that'll sit right in any home office environment. The excessive levels of bass is a bit of a kicker, but if you enjoy that or don't mind altering the EQ a little the Prisma Encore is a stunning bit of kit. Edifier isn't one of the most well-known of speaker makers, yet has provided a vast array of solid, dependable and affordable speaker systems. Certainly it's a company that, although unheard of 8 years ago, has now cemented itself thoroughly alongside the better known audio brands when it comes to desktop sound systems. There's always been a lack of premium options available to those looking for an impressive 2.1 speaker system so does the Prisma Encore fit that gap? The Prisma Encore sports a really striking visual style. The eccentric design aesthetics that Edifier is well associated with certainly makes its presence felt here. The subwoofer, features a downwards firing 5-inch driver, sleekly hidden away under a gloss pyramid style design which looks for all the world like one Tim Schafer's Tentacles when stood on its side. And it's more than enough to make the room shake. In fact, without any tweaking whatsoever it does come across as quite bass heavy. Although this is adjustable in your device settings it can be troublesome for those looking to utilise either Bluetooth or a mobile device. The satellite speakers are clean, crisp and sharp, with plenty of highs and mids for a well rounded sound. In our testing we found that after a bit of tweaking on the bass side of things the Prisma Encore provided excellent clarity, even at high volumes with minimal background noise. Setting up the Encore is as standard as it comes and makes the speaker system easily accessible. The two satellites plug directly into the rear of the subwoofer, and then a 3.5mm cable heads to whatever device you're looking to connect to. There's no option for optical audio, which honestly feels like a miss on Edifier's part, even given the relatively reasonable point of the Prisma Encore. But all in all you won't notice any drop in signal degradation due to excess noise. This is mostly in part due to Edifier's digital signal processing and dynamic range control technologies integrated into the amplifier within the sub. The big selling point for the Prisma Encore comes from its Bluetooth compatibility. After you've initially paired your device, it's incredibly quick to reconnect, even swapping between multiple Bluetooth inputs with little to no trouble. The inclusion of the wireless remote is a nice feature, although honestly it would've been great to see a dedicated wired controller, allowing at least some ability to lower the bass. When you do utilise Bluetooth it becomes impossible to adjust the level of bass output that heads to the device. Another issue occurs after you power off the subwoofer. Holding the button on top for 2 seconds will switch off the entire system, however as soon as you turn it back on it will have reset the volume on the sub, meaning you could be in for a nasty shock when switching on a device or playing a track. That fantastically bold and elegant design style is stunning, especially on the subwoofer. It's almost a shame to put it on the floor in fact. It's incredibly easy to setup, and provides a crisp, clear and well rounded sound signature without compromising anywhere once you've tweaked the bass a little. And we're back to the bass - it's just a little too heavy for our liking. If you have kids, live in a semi-detached house or generally enjoy the quieter side of life, it might not be the best option for you. The fact there's no way of altering that via Bluetooth also isn't brilliant, and the volume reset after a turn off can drive you to the point of madness. For the price point the Prisma Encore provides fantastic sound quality and a stunning aesthetic that'll sit right in any home office environment. The fact it comes in both black and white means it's an easy fit for any space and, despite the lack of optical audio, the Prisma Encore provides a nicely well rounded soundscape. The excessive levels of bass is a bit of a kicker, but if you enjoy that or don't mind altering the EQ a little the Prisma Encore is an impressive bit of kit.